Together with light artist Jaap van den Elzen, I made a sound- and lightscape titled Waxing, Waning for the festival Nederlandse Muziekdagen 2009. In the concert hall of Muziekgebouw aan 't IJ sound becomes space, space became light and light became time. Waxing, Waning - a tidal game for the senses - was made specifically for the LED light walls in the concert hall of the Amsterdam Muziekgebouw. The electronically processed ambient music has a constant dialogue with lightscape of Van den Elzen. 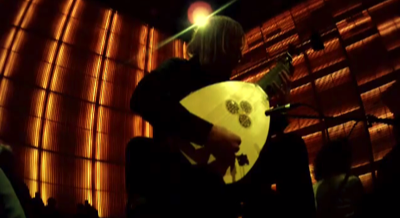 Electrical luitist Jozef van Wissem improvised in this singing and iridescent environment. Waxing, Waning is a multi-sensory experience, a breathing space of color, sound and light.